Hubble Space Telescope view revealing Uranus surrounded by its four major rings and by 10 of its 17 known satellites. This false-colour image was generated by Erich Karkoschka using data taken on 8 August 1998, with Hubble's Near Infrared Camera and Multi-Object Spectrometer. 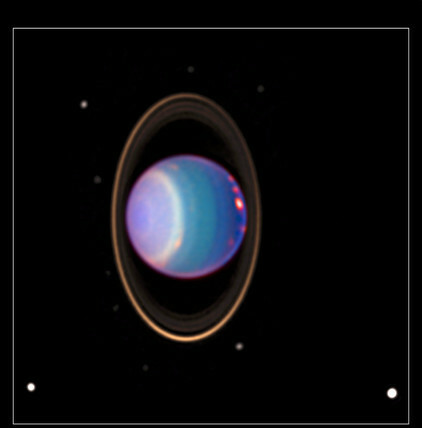 Hubble found about 20 clouds - nearly as many clouds on Uranus as the previous total in the history of modern observations. The Wide Field/Planetary Camera 2 was developed by the Jet Propulsion Laboratory and managed by the Goddard Space Flight Center for NASA's Office of Space Science.